With the ultimate objective of improving the service delivery to the consumers, the C. M. W. S. S. Board is taking every step to create a motivating environment for its employees particularly Field Level Workers working in unhygienic conditions. The following safety equipments and accessories are provided to the workers. Used to enter work spots where Oxygen level is low/presence of poisonous gases. The user has to carry the compressed air cylinder on his back. Suitable to be operated in Sewer water with a provision to attach external Air hose from a compressor/modular Airline Trolley System. The wearer can use this Mask and have comfortable breathing air even at the depth of about 8 meters inside a deep Manhole filled with raw sewage. The Safety body harness may comprise straps, fittings, buckles or other elements, suitably arranged and assembled to support the whole body of a person and to restrain the wearer during a fall and after the arrest of a fall. Normal Face Mask with Canister is used to protect the wearer from inhaling nuisance/toxic dust, acid gases in water supply & sewage sectors. This equipment will be used by employees entering confined spaces similar to underground tanks, pump pits in sewerage pumping stations etc. where oxygen concentration is more than 17% in the surrounding area. Hand Gloves is used to protect hands of wearer from direct contact of hazardous materials/Electric shock in water supply & sewage sector. Safety Goggles is used to protect the eyes of wearer from chemical splash, dust-mist and other eye damaging factors in water supply & sewage sectors. Safety Helmet is used to protect the Head of wearer from heavy impact in water supply & sewage sectors. Head Lamp is used along with safety helmet for lighting purpose. Reflecting jacket is used during work at night times to prevent accident. 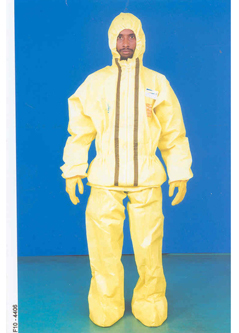 Wadder Suit will basically prevent direct contact of sewer with the body of the wearer. The Wadder Suit will cover the body of the wearer entering and working in the sewer wells/Manhole chambers. Chlorine Mask is used to protect the wearer from inhaling chlorine gas in water supply & sewage sectors. This equipment will be used by employees entering confined spaces similar to underground tanks, pump pits in water distribution stations, sewerage pumping stations etc. where oxygen concentration is more than 17% in the surrounding area. Safety Gumboots will be used by the employees working in water distribution & sewage sectors. 1. Self Retractable Lanyard including Safety Tripod for entering chambers. Safety Tripod provides an automatic locking function in the event of the user falling. The length of the lanyard is adjustable automatically by a tensioning and retraction system. 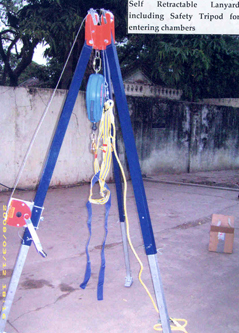 The equipment is generally attached to a Tripod/Structure with the User moving vertically downwards to the equipment and this equipment is used for entering into confined space for men and materials. 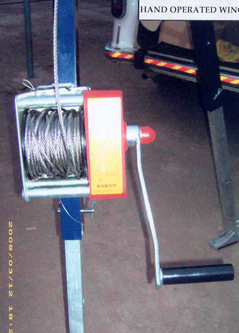 Hand Operated Winch is used to lower or lift men and material in the work site. Modular Airlines Supply Trolley System is used by the wearer where air bottle cylinders could not be directly taken to work site. 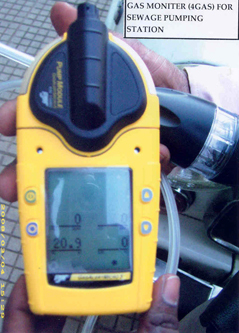 Gas Monitor is used in Water Distribution Stations to identify the presence of oxygen, toxic and flammable gases before entering into a work site. Gas Monitor is used in Sewage Pumping Stations and Depots to identify the presence of oxygen, toxic and flammable gases before entering into a work site. Safety Torch is used in sewage pumping stations and manhole entry operations for lighting purposes where flammable gases are present. Oxygen Resuscitator kit is used at the time of emergency situation when employees exposed to hazardous gases. Safety Showers will be used for flushing the eyes / body that had exposure to hazardous material or environment during carrying out work in water distribution and sewage sector. This pipe set will be used inside the manhole chamber to insert the jet rodding hose to the sewer line. The first aid box will be used to the workers during unprecedented incident. The first aid box shall contain minimum components.